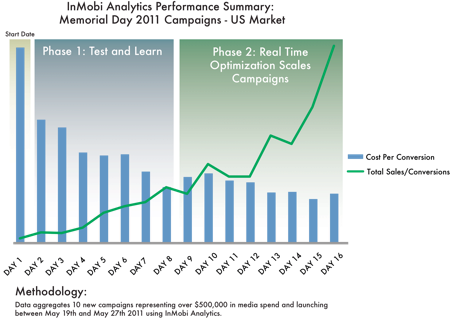 Today we releasedn excellent case study on the power of mobile advertisingnalytics. We tracked 10 new campaigns, that launched around Memorial Day in the retail, gaming, and entertainment verticals. The campaigns represented over $500,000 in total spend and all had one thing in common, they leveraged our InMobinalytics product. Unlike other tools in the market, InMobinalytics offersutomated real-time conversion optimization technology inddition to detailed reportingnd insights forgency and brand users.